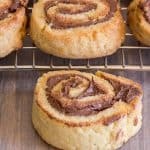 Crunchy Nutella No Yeast Roll Ups, a crunchy cookie, the perfect snack, dessert or even for breakfast. Kids will love them. In a large bowl add flour and butter, mix with a fork until crumbly, then add the egg, sugar, salt and vanilla. Mix with the fork until mixture almost comes together, then move to a lightly floured flat surface. Knead until dough comes together and is smooth. Wrap in plastic and refrigerate 30 minutes. Remove from fridge and roll out on a floured surface to approximately 7 x 11 inch long rectangle. (make sure surface is always lightly floured so dough doesn't stick when rolling up). Spread with Nutella but do not spread to the ends, leave a small border. Roll up from the long side (as tightly as you can but it doesn't have to be really really tight). Cover with plastic and refrigerate 30 minutes. 15 minutes before removing from fridge Pre-heat oven to 350°. Remove from fridge and cut into 1/2 inch thick slices, place slices on a parchment paper lined cookie sheet and bake for approximately 20 minutes or until golden. Let cool completely. Enjoy!